It’s the middle of spring. We’ve seen our first 90 degree day in central Iowa. That means, of course, that it’s time to take stock of our clothing. The winter stuff largely heads to storage, as we don’t need thick long-sleeved shirts at this point and our pants are mostly skirts and shorts without many pairs of jeans or other pants necessary. With growing children, though, that means new summer clothes are needed. Here’s exactly how I shop for them, since it’s what I did on Tuesday afternoon, after visiting some yard sales the previous weekend and finding very little. My first stop was at a pair of local Goodwill stores, in Ames and Ankeny, IA. I used Goodwill as my first stop as they often have the lowest prices around. However, the selection there is often atrocious, with a lot of items in poor shape with some gems mixed in. You have to really browse through the clothes there to find items that you’re looking for and the clothes are often disorganized. This time around, I didn’t find anything like what I was looking for. The summer clothes had been picked over fairly well and I wasn’t satisfied with what was left. In the past, however, I have found some great items hidden away in the racks, but it wasn’t to be this time. My next stop was at a children’s clothing consignment shop, the place where most of our children’s clothes come from. I went to Duck Worth Wearing in Ames, Iowa. A good clothing consignment shop will feature high-quality used clothing items that aren’t threadbare. The items are things that you’d generally have no problem wearing and the items are well-organized. It’s not all that different than shopping in a normal clothing store. Well, there is one difference – the prices are very nice. I picked up the clothes you see above in my stop there. 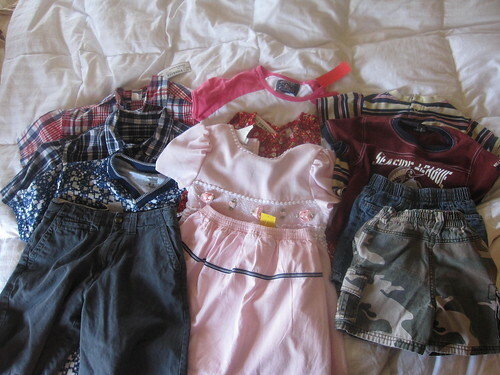 This amounted to multiple outfits for each child, a couple of wonderful dresses for my daughter, and all of the items in very good shape and well-made. Total cost? Around $45, plus a $5 off coupon for any purchase the next time I’m in the store. I have used other consignment shops in the area, but in terms of quality children’s clothing, Duck Worth Wearing provides the best clothes for the price. This isn’t the end of our summer clothes buying, of course, but it’s a good start. We’ll keep looking at yard sales as they wear these items on nice days and we’re likely to return to that consignment shop in the future.